The profiles and developmental trajectories of adaptive behavior were cross-sectionally examined in 80 children with Down syndrome ages I to 11.5 years using the Vineland Adaptive Behavior Scales. Profile findings indicated a significant weakness in communication relative to daily living and socialization skills. Within communication itself, expressive language was significantly weaker than receptive skills, especially when children's overall communicative levels were above 24 months. One to 6-year-old children showed significant age-related gains in adaptive functioning, but older subjects showed no relation between age and adaptive behavior. There was, however, increased variability within this older group, implying that not all children plateau in adaptive development during the middle childhood years. Implications for development in Down syndrome and intervention programs were discussed. Dykens, E, Hodapp, R, and Evans, D. (2006) Profiles and development of adaptive behavior in children with Down syndrome. Down Syndrome Research and Practice, 9(3), 45-50. The purpose of this study was to assess whether verbal-motor performances deficits exhibited by individuals with Down syndrome limited their ability to acquire gross motor skills when given visual and verbal instruction together and then transferred to either a visual or verbal instructional mode to reproduce the movement. Nine individuals with Down syndrome (6 males, 3 females) performed 3 gross motor skills. Both visual and verbal instructional guidance was given to the participants over a 4-day period. Twenty-four hours later, the participants were video recorded as they produced the movements (used as baseline measures). On Day 6, they were randomly assigned into verbal and visual groups and required to reproduce the skills while the experimenter provided either visual demonstration or verbal instructions depending on the group. Based on skill performance scores, participants in the verbal-motor performance group demonstrated a lower level of proficiency and an increased number of performance errors when compared to participants in the visual-motor performance group. Moreover, while the visual group demonstrated an increase in performance levels compared to baseline measures, the opposite effect was seen for the verbal group. Meegan, S, Maraj, B, Weeks, D, and Chua, R. (2006) Gross motor skill acquisition in adolescents with Down syndrome. Down Syndrome Research and Practice, 9(3), 75-80. This paper discusses the evidence that the specific developmental profile frequently described as being associated with Down syndrome - a profile of communication weaknesses relative to social and daily living skills - can be changed. 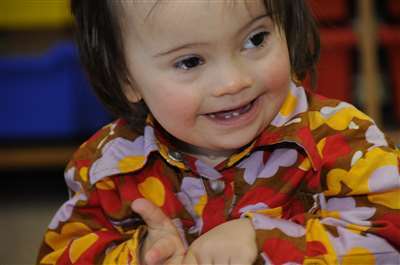 It is not an inevitable outcome of having Down syndrome. Drawing on data collected to explore the outcomes of fully inclusive education for school-age children with Down syndrome, the authors identify that the profile is seen in teenagers in special education settings but is not evident for teenagers in inclusive education. They argue that this is the result of both the effects of fully inclusive education and teaching approaches which have been adapted to address the cognitive and communication weaknesses of the children from an early age. Buckley, S, Bird, G, and Sacks, B. (2006) Evidence that we can change the profile from a study of inclusive education. Down Syndrome Research and Practice, 9(3), 51-53. Fidler, D, Hepburn, S, and Rogers, S. (2006) Early learning and adaptive behaviour in toddlers with Down syndrome: Evidence for an emerging behavioural phenotype?. Down Syndrome Research and Practice, 9(3), 37-44. Buckley, S, Bird, G, Sacks, B, and Archer, T. (2006) A comparison of mainstream and special education for teenagers with Down syndrome: Implications for parents and teachers. Down Syndrome Research and Practice, 9(3), 54-67. There has been huge growth in the use of information technology (IT) in classrooms for learners of all ages. It has been suggested that computers in the classroom encourage independent and self-paced learning, provide immediate feedback and improve self-motivation and self-confidence. Concurrently there is increasing interest related to the role of technology in educational programs for individuals with intellectual disabilities. However, although many claims are made about the benefits of computers and software packages there is limited evidence based information to support these claims. Researchers are now starting to look at the specific instructional design features that are hypothesised to facilitate education outcomes rather than the over-emphasis on graphics and sounds. Research undertaken as part of a post-school program (Latch-On: Literacy and Technology - Hands On) at the University of Queensland investigated the use of computers by young adults with intellectual disabilities. The aims of the research reported in this paper were to address the challenges identified in the 'hype' surrounding different pieces of educational software and to develop a means of systematically analysing software for use in teaching programs. Lloyd, J, Moni, K, and Jobling, A. (2006) Breaking the hype cycle: Using the computer effectively with learners with intellectual disabilities. Down Syndrome Research and Practice, 9(3), 68-74.